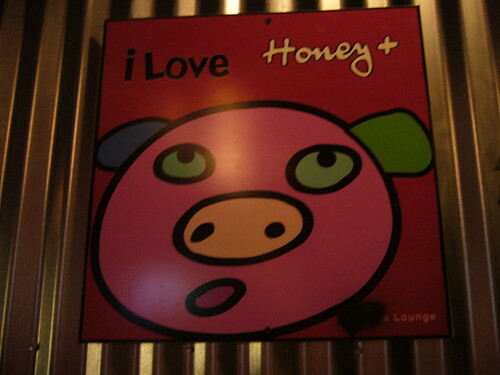 Last night a bunch of us went to a Korean BBQ place called Honey Pig in Annandale, VA, about an hour’s bus ride away from DC. I never knew this but there’s a really big Korean community in that area; once we got off the bus, almost all the signs I saw had Korean translations as well. When we went inside the restaurant, there was pop music – Korean and American – blaring as loud as possible and tons of little bbq stations set up. The decor wasn’t fancy or pretentious at all. In fact, it reminded of those little hawker stands in China where everyone just crowds around a table on makeshift chairs and just eats to their heart’s content. One of us pointed out the huge posters advertising their current sales (1 serving of barbecued pork belly for only 12.99!) but it turns out that those posters are always up to make the customers feel like they’re getting a better deal. We were seated in the back of the restaurant, far away from all the really loud music, and give two grills. 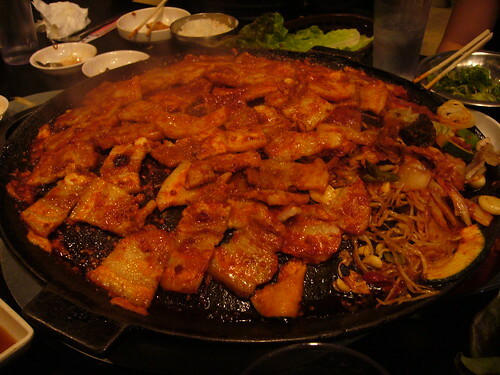 Because one of the girls, Yung, had been before, she suggested that we just get pork belly instead of beef, which apparently was only mediocre. And oh. my. god. Well, in all honesty, the plain pork belly wasn’t that great; our lady didn’t get a good first sear and some of it was overcooked, but whatever’s in the spicy sauce of the second round, I LOVE. I’m willing to bet there’s a healthy amount of gochujang in there and if that’s really the case, I’m making some as soon as I get home. 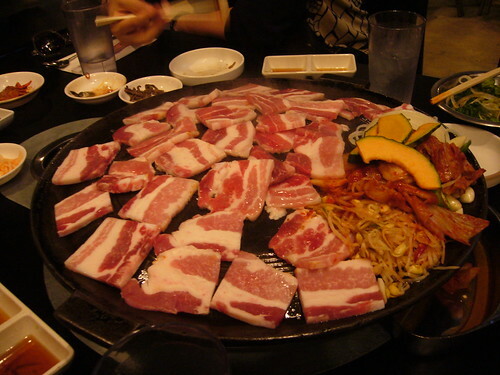 You are currently reading Korean Barbecue in Annandale, VA at Notes on Food.